The Basic Design Wind Speed, V (mph), corresponds to a 3-second gust speed at 33' above ground in Exposure Category "C" and is associated with an annual probability of 0.02 of being equalled or exceeded (50-year mean recurrence interval). For Basic Wind Speed Map (Fig. 6-1) see 'Wind Map' webpage. Urban and suburban areas, wooded areas or other terrain with numerous closely spaced obstructions having the size of single family dwellings or larger. Open terrain with scattered obstructions having heights generally < 30 ft. This category includes flat open country, grass lands, and all water surfaces in hurricane-prone regions. Flat, unobstructed areas and water surfaces outside hurricane-prone regions. This category includes smooth mud flats, salt flats, and unbroken ice. Exposure B shall apply where the ground surface roughness condition, as defined by Surface Roughness B, prevails in the upwind direction for a distance of at least 2630 ft. or 10 times the building height, whichever is greater. Exposure C shall apply for all cases where exposures B and D do not apply. Exposure D shall apply where the ground surface roughness, as defined by Surface Roughness D, prevails in the upwind diection for a distance >= 5,000 ft. or 10 times the building height, whichever is greater. This program assumes that a Gable roof is symmetrical, as the ridge line is assumed in the center of the building width. For flat roofs (roof angle = 0 degrees), either Gable or Monoslope may be used. The Effective Area, for a component or cladding panel equals the span length times the effective width that need not be less than 1/3 of the span length; however, for a fastener it is the area tributary to an individual fastener. main wind-force resisting systems (MWFRS). Roof Angle, q = deg. h = he (per Sect. 6-3). Width 'a' is equal to 10% of least horizontal dimension or 0.4*h, whichever is smaller, but not less than either 4% of least horizontal dimension or 3'. Both load cases 1 and 2 are be checked for roof angle, 25 degrees < q <= 45 degrees. use q = 0 degrees (assumed). Notes:???? 1. 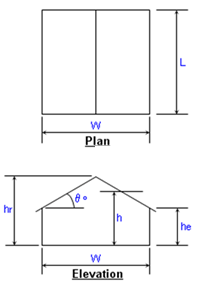 For Method 1: Simplified Procedure of Section 6.4 to be used for an enclosed low-rise building?? ???? a. Building is a simple diaphragm building, in which wind loads are transmitted through floor?? ???????????? and roof diaphragms to the vertical Main Wind-Force Resisting System (MWFRS). ???? b. Building is a low-rise building where mean roof height, h <= 60 ft., and h <= min. of L or W. ???? c. Building is enclosed and conforms to wind-borne debris provisions of Section 6.5.9.3. ???? d. Building is a regular shaped building, having no unusual geometrical irregularity. ?????? f. Building is not classified as a flexible building so it is considered "rigid". ???? 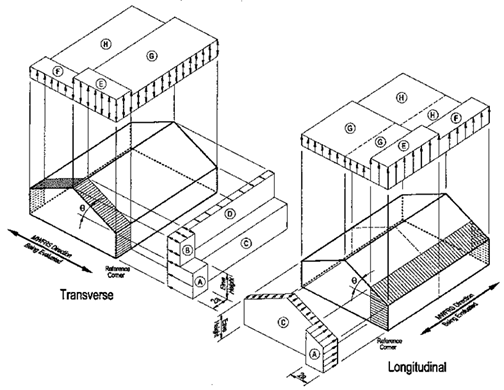 g. Building is not subject to across-wind loading, vortex shedding, etc. ???? h. Building has no expansion joints or separations. ?????? i. Building is not subject to topographic effects, no abrupt topographic changes. ?????? j. Building has an approximately symmetrical cross section in each direction with either a?? ???????????? 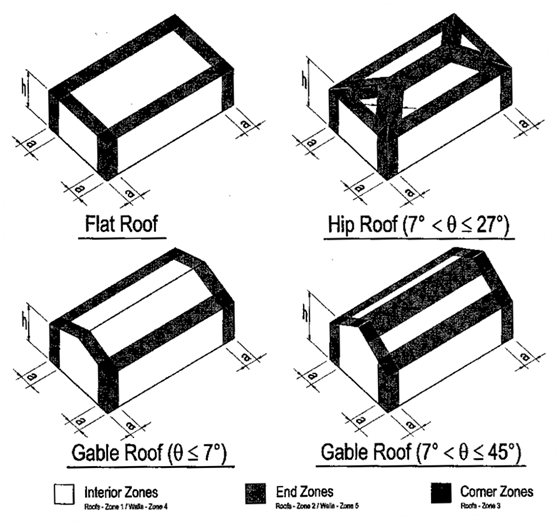 flat roof, or gable roof with q <= 45 degrees. ???? e. MWFRS pressure coeff's. from Figure 6-10, and C&C pressure coeff's. from Figure 6-11. ?????? f. Design wind pressure, Ps = l*I*ps30, in psf. Design wind pressures are net pressures (sum of external and internal pressures). Wall net pressure for MWFRS is total for both windward and leeward walls. (+) and (-) signs signify wind pressures acting toward & away from respective surfaces. If pressures for Zones "B" and "D" < 0, assume = 0. For the design of the longitudinal MWFRS use roof angle, q = 0 degrees. The total design MWFRS horizontal load is the total horizontal wind load on either the length (L)?? or the width (W) of the building respectively assuming one end zone of a width = 2*a. Minimum wind load for MWFRS design shall be 10 psf applied on projected vertical plane. Minimum wind load for C&C shall be 10 psf acting in either direction normal to surface. ???? a. ASCE 7-02 Standard, "Minimum Design Loads for Buildings and Other Structures". ???? b. "Guide to the Use of the Wind Load Provisions of ASCE 7-02"
???????????? by: Kishor C. Mehta and James M. Delahay (2004).